1. VSAN stands for virtual storage are network. 2. A virtual storage area network is a logical partition in storage area network. VSAN allows traffic to be isolated within specific partitions of a storage area network. 3. The concept behind a VSAN is often compared to that of a VLAN. VLAN segregate broadcasts from other networks. 4. The term is most often associated with cisco systems and is often mentioned in conjunction with zoning. Zoning splits a SAN into multiple isolated subnetworks. 5. In October 2004, the technical committee T11 of the international committee for IT standards approved VSAN technology as a standard of the American National Standard Institute (ANSI). 6. Example of VSAN is VMware which is a virtualization and cloud computing software provider in short VMware is a VSAN provider. 7. 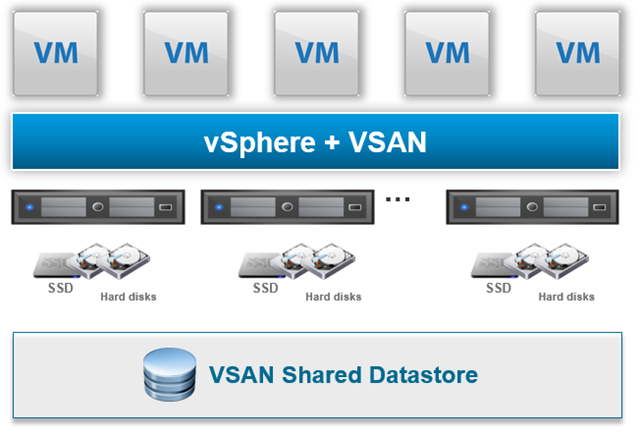 A virtual SAN creates software defined shared storage for virtual machines. 8. VSAN provides the ability to dynamically scale storage capacity & performance as needed and exposes the underlying physical storage to the virtual machine through a policy driven control pane. 9. It can also be defined as software defined storage. 10. VSAN is a collection of ports from a set of connected fiber channel switches, that form a virtual fabric. 11. Ports within a single switch can be partitioned into multiple VSANs. Conversely multiple switches can join a number of ports to form a single VSAN. Makes your job easier by simplifying storage provisioning & management for Vsphere. Deploy storage with just a few mouse clicks from the Vsphere web client & enjoy native integration with the VMware stack. Virtual SAN ensures that data is never lost if a disk, host, network or rack fails and can even tolerate entire site failures with synchronous replication & stretched clusters. VSAN delivers all flash performance with up to 100,000 IOPs per host, support for Vsphere availability technologies like high availability asynchronous replication, stretched cluster capabilities and storage efficiency features for all flash including deduplication comparison and erasure coding. VSAN delivers predictable, elastic and non disruptive scaling of storage and compute resources, eliminating costly forklift updates every VSAN cluster can scale out one node at a time or scale up by adding capacity to existing host and is capable of achieving over 8 PB of row storage capacity. VSAN delivers much better performance than a virtual appliance or external device. Experience up to 100,000 IOPs per host with all flash and scale up to 64 host per cluster. 1. The use of multiple VSANs can make a system easier to configure and scale out. 2. Subscribers can be added or relocated without the need for changing physical layout. 3. If a problem occurs in one VSAN, that problem can be handled with a minimum of disruption to the rest of network because the independence of VSAN minimizes the total systems vulnerability, security is improved. 4. VSANs also offer the possibility of data redundancy, minimizing the risk of catastrophic data loss. 5. The use of VSAN allows the isolation of traffic within specific portions of the network. 6. VSANs can also be configured separately and independently.